The Chicago Eco-Bridge would complete the last major recommendation of the 1909 Burnham Plan of Chicago in a thoroughly modern way that celebrates the city’s future as well as its past. The two-mile bridge, a breakwater in the Monroe Harbor, celebrates Chicago’s position as the greenest city in the United States. The bridge creates a grand new civic space, providing recreational opportunities and offering unparalleled views of the skyline from a central observation tower. A central Eco-Tower, designed to harvest wind and solar power, functions as a public observatory and also include food service or other amenities. A plaza at the tower site can be used as a temporary or permanent performance plaza. 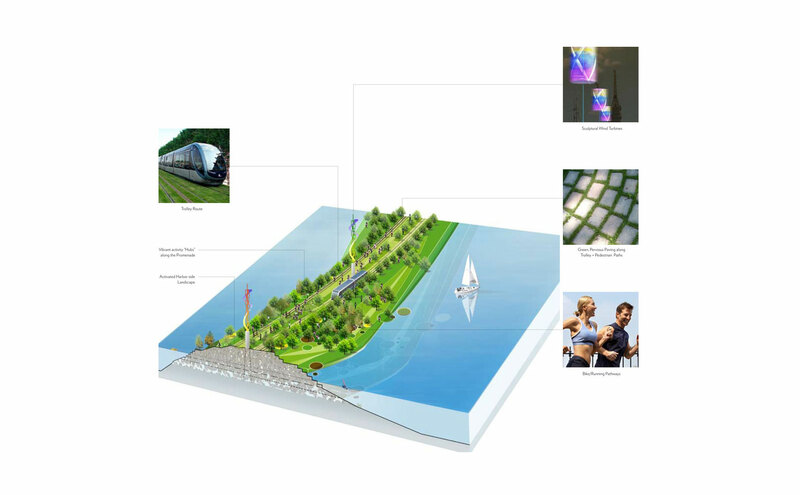 At either end of the bridge, interactive exhibit spaces could house a Great Lakes Museum or other cultural facility to complement the nearby Museum Campus. Vertical-axis wind turbines incorporated located along the bridge add economic value through the production of clean, renewable energy and showcase Chicago’s dedication to sustainability. The turbines double as pieces of sculpture, offering an opportunity for collaboration with visual artists and engineers and the creation of a lively public art walk. 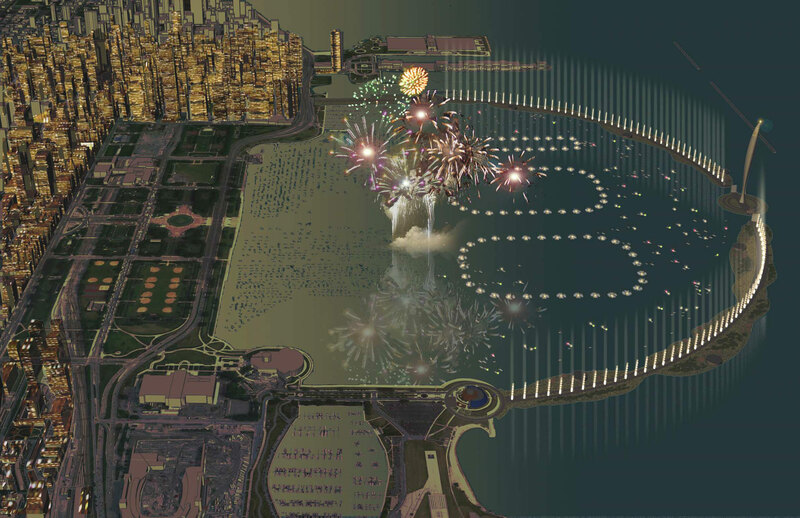 The turbines could also be outfitted with LED lights, creating a soft necklace of light surrounding the harbor in the evening. The park would be easily accessible from Grant Park and the downtown area. Pedestrian walkways and dedicated bicycle paths would encourage healthful and sustainable modes of transit. An electric or solar trolley system could further augment the bridge’s accessibility, providing transport from the neighboring downtown areas. 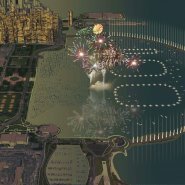 The project is also intended to enhance Chicago’s bid to host the 2016 Olympic Games. The observation tower is a prominent and central place to house the Olympic flame. The breakwater provides ample space for rowing and sailing events in calm water and could offer terrific viewer access for these events. The Eco-Bridge also showcases the ecology of the Great Lakes and provides a haven for fish and water plants. 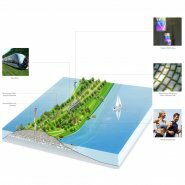 Smith and Gill's "eco-bridge": Coming to Chicago's lakefront?